When Los Angeles teachers began striking this week, their list of demands–better wages, more support staff, smaller class sizes–sounded all-too-familiar to teacher walkouts we’ve seen in the recent past. But the size and scope of this teacher strike–the first in L.A. in 30 years–is anything but typical. LAUSD is the second-largest school district in the country–serving more than 600,000 students across 710 square miles. More than 30,000 members of the district’s teachers union, United Teachers Los Angeles (UTLA), are participating in the strike–including non-teachers like nurses and school psychiatrists. 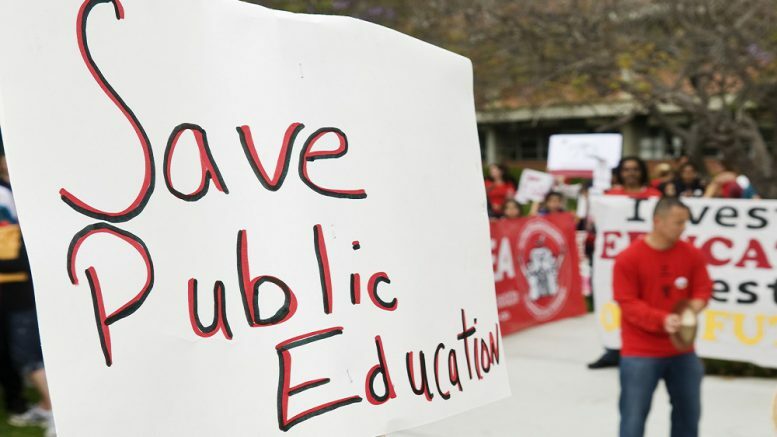 District Superintendent Austin Beutner estimated that the first day of the strike alone cost the district $15 million in lost state funding tied to student enrollment, the Los Angeles Times reports. All strikes are inherently political. But, the divisiveness seen in the L.A. teacher strike, particularly around the issue of charter school expansion, seems to have widened the divide between the two sides. Teachers are concerned about a perceived emphasis on the part of school district leaders to expand charter schools in the district, a move that would potentially siphon away precious funding from traditional public schools. District leaders, including Beutner, say that teachers should focus their attention on lobbying California’s state government for more funding, according to the L.A. Times. What I can say–based on my research and interactions at schools across the country–is that most school districts can do a much better job of encouraging authentic, productive conversations, through stronger engagement, before disputes like this one arise. But, school leaders can’t simply will community engagement to happen. They need to implement well-planned strategies, training, and key tools around customer service. They also need active support and participation from parents, staff, and community members. As we look for lessons to draw from the situation in L.A., here are important questions to consider for the adults–parents, teachers, school leaders–who are vitally responsible for students’ success. Parents: Are you actively participating in important conversations about your child’s education? Do I send my child to school where they’ll have significantly less peer and teacher support then they normally do? Will my child be safe in a school with diminished staff? Should I allow my child to take an absence and stay home? Should I use the teacher strike as a teaching lesson to help my children understand important issues facing the district? Teacher strikes affect students and their parents harder than anyone else. But, students and parents often feel voiceless in these disputes. Parents need to actively reach out to their districts throughout the school year and regularly make their voices heard on important issues–from strategic planning decisions to boundary modification to labor disputes to parent-teacher conferences. Thankfully, technology–including social media–gives parents the power to interact with their schools, even when their busy lives don’t allow them to physically attend school functions. At Fontana USD, not far from Los Angeles, a growing number of parents use a tool called Let’s Talk!–an online customer service and community engagement tool K12 Insight developed and helped to roll out in the district–to make their voices heard, even when they can’t physically be at their child’s school. Teachers and staff: Do you feel empowered to raise concerns and contribute to important district decisions? In a recent study on teacher trends, veteran education researcher Richard Ingersoll found that 44 percent of new teachers leave the profession within five years. Our own research at K12 Insight tells a similar story: The perceived inability to provide input on district leaders’ decisions has a negative impact on employee engagement. The good news? Teachers and staff now have the means to make their voices heard through multiples channels, thanks in large part–once again–to technology. K12 Insight worked with Fort Bend ISD in Texas to give teachers a stronger voice on important issues. A growing collective frustration around communication between teachers and staff and administrators spurred district officials to create Talent Connection. The online portal allows employees and prospective employees to engage the district’s HR department in conversations about important topics, such as onboarding, employee records, benefits, and other issues. Since launching the portal, the district reports less complaints and growing satisfaction among teachers and staff. Superintendents and school leaders: Have you made it a priority to actively engage your community and staff? While parents and teachers need to participate in important conversations, in the end it’s up to school leaders to facilitate those dialogues. School districts should provide multiple ways for employees and community members to reach out, respond to inquiries in a timely manner, and actually use the feedback to make important decisions and help prevent potential disputes before they happen. Could the L.A. strike have been avoided? It’s impossible for me to say. But, parents, teachers, and school leaders would be wise to take note of the turmoil in southern California, and determine how they can actively encourage a positive dialogue around the issues that matter most to their students and communities. Want more expert analysis on the issues facing public schools? Sign up to get regular updates from TrustED. Simply enter your email below. Dr. David Blaiklock is Head of Research at K12 Insight. Be the first to comment on "L.A. teachers strike: 3 key considerations for parents, teachers, and school leaders"